I was a little dubious when I first started this mini series. I must say, though, I was very pleased with it. I found it entertaining and exciting. It is a take on the Wizard of Oz. But done the "SciFi" channel way. 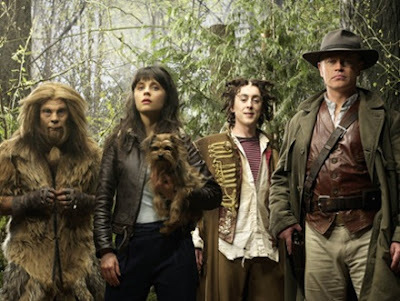 Still had Dorothy (DG), the Cowardly Lion (a caveman like seer), the Tin Man (a police man who was trapped in a tin suit of armor for years), and the Scarecrow (an adviser to the queen who had part of his brain removed). But the story was much more in-depth. I did like it! I would definitely recommend it. It had some violence, but not more than I would approve of (I do like a little violence, if you don't know me well, big LOTR, Harry Potter, Star Wars, Doctor Who, and Pirates fan). It did have brief language. About 2 times, if I recall correctly, they said the "B" word. But, if any of you watch regular Prime Time television, for some reason, this is now acceptable. Beats my why. I still find it distasteful. 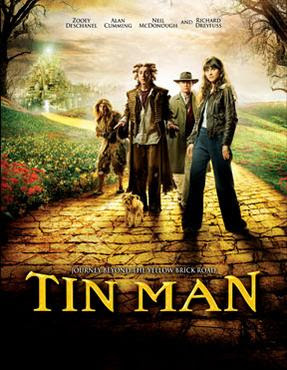 So, I'll give "Tin Man" a thumbs up, and would encourage you all to watch it if you get the chance. Below are the links to watch this mini series online. As a whole, I liked the series, but the ending (the last episode really) was a tad of a disappointment. I also got sick of them beating us over the head with the similarities with the original. We get it, Tin Man is missing a heart. You don't need to actually say it. Jeeze. i liked it. i thought it was clever, and visually entertaining. i hope they put it on dvd so i can buy it. As for the end, I do love it when things tie up nicely. The only better ending would have been for DG and the Tin Mans son to get together :) hehehe. And yes, Erin, I think I would buy this one too!